This patient presented with loose skin around her jowl area which caused creasing of the skin. This excess skin had a heavy appearance and gave the patient a very drawn appearance. This patient underwent a skin Suture Lift procedure in combination with Erbium laser resurfacing. 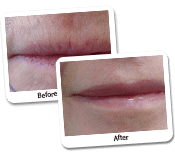 The Suture Lift has lifted the skin around the corners of the mouth nicely and reduced the deeper creases. The Erbium laser has smoothed out the finer creases and lines in the skin, leaving a fresh and younger look. Discover the Possibilities of a Facelift with Laser Resurfacing Techniques! In this day and age, there are many procedures and treatments that can make you look younger. One of these treatments is the face laser resurfacing technique, which can give you a nice facelift without the use of incisions. To learn more about laser resurfacing, and its benefits that are similar to the facelift, please read our case study and additional information below! What Problems Did the Patient Encounter Before Laser Resurfacing? 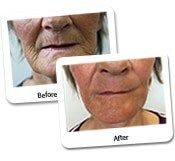 The patient in this case study had loose skin around her jowl area, which caused a significant amount of skin creasing. The excess skin around the treatment area also presented a heavy appearance, making the face of the patient look drawn. Which Treatments Were Used to Correct the Problems? To restore the youthful appearance of the patient in this case study, Dr Lanzer executed a Suture Lift Procedure and Laser Resurfacing with an erbium laser. With the Suture Lift Procedure, Dr Lanzer was able to lift the skin around the corners of the mouth, subsequently reducing the deeper creases that were quite prominent before. After treatment with the Suture Lift Procedure, the patient underwent a laser resurfacing treatment with erbium laser. With the help of the laser resurfacing treatment, Dr Lanzer was able to smooth out finer creases and lines in the skin; this resulted to a more youthful and rejuvenated appearance for this patient. Laser resurfacing is a treatment used to reduce the appearance of facial wrinkles and skin irregularities, for example blemishes and acne scars. Laser resurfacing can be executed with a variety of lasers, with the most common the erbium and carbon dioxide lasers. To reduce skin irregularities, a laser resurfacing treatment will use concentrated beams of light, which pulse over the surface of the skin. Due to the nature of the treatment, and the techniques used during the treatment, cosmetic surgeons are able to apply laser resurfacing to delicate treatment areas such as the face, hands, neck and chest. What Is a Suture Lift Procedure? The Suture Lift Procedure is a common facelift procedure, often used to make minor improvements in patients who have sagging skin. Suture Lift Procedures, also referred to as thread lift procedures, tend to focus on treatment areas such as the eyes, forehead and the nasolabial fold areas. There are also other facelift procedures that can be combined with laser resurfacing treatment. These procedures depend on the treatment area and on the personal preferences of the patient in question. The erbium laser is especially designed for the execution of laser resurfacing procedures. 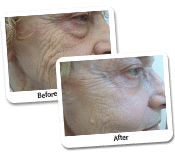 It is able to treat wrinkles and lines of moderate depth, which can be present on the face, hands, neck or chest. How Much Downtime Should I Expect from this Procedure? Downtime and/or recovery time will depend on the treatments you want to take advantage of. For example, recovery time for a treatment with laser resurfacing and Suture Lift will be longer than the recovery time for a patient who only had laser resurfacing. Treatments such as laser resurfacing are executed on an outpatient basis; this means that patients do not have to stay in our clinic overnight. During the first 24 hours after your laser resurfacing treatment, it is important to keep the treated area as clean as possible. Aftercare during the recovery period involved the application of a special ointment and general cleaning of the treated area. In general, patients can expect a recovery period of 10 to 21 days, although most people can get back to their normal activities within a few days. Are There Side-Effect Accompanying Laser Resurfacing? As is the case for almost all cosmetic procedures and treatments, there are some minor side-effects patients may encounter after this treatment with erbium or carbon dioxide laser. One of the most common side-effects patients report is itching during the first 12 – 72 hours after the procedure. Even though this may cause the patient a little discomfort, this symptom is quite normal and tends to dissipate fairly quickly. Redness of the skin is also quite common after laser resurfacing procedures. However, patients can easily hide the redness by using some cover-up. When you choose makeup to cover skin redness, check to see if your makeup is oil-free. Using an oil-based makeup could lead to outbreaks and complications, so it is important to avoid such products until the medical staff at the Dr Lanzer Clinic confirms it is okay to use such products again. Should I Take Other Things into Account for Aftercare? After any laser resurfacing procedure, it is extremely important to keep your skin moisturised. During this time, it is also important to avoid any beauty products containing the ingredients Retin A or glycolic acid. Approximately 6 weeks after the procedure, it should be okay to use such products again, although it is always recommended to contact the medical staff at the Dr Lanzer Clinic before you start using those products again. When you are recovering from your laser resurfacing treatment, it is also important to have a broad-spectrum sunscreen; this is necessary because the skin is a little more delicate after a resurfacing procedure. A broad-spectrum sunscreen will block ultraviolet A and ultraviolet B, subsequently protecting your skin. Patients who have a good sunscreen should still avoid harsh sunlight for some period of time. No matter how good your sunscreen is, there are always going to be some sunrays who make it through. To avoid problems with your skin, it could be wise to stay in the shade when the harsh sun comes out. Complications after a laser resurfacing procedure are rare, but not impossible. The medical team at the Dr Lanzer will inform you on what to look out for and how you should protect yourself against these complications.